You might think technology would spell the end of books and libraries. 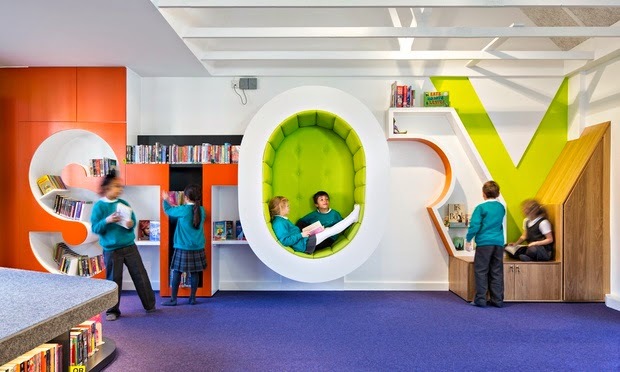 But many schools have embraced the digital revolution and built innovative spaces that foster a love of literature. What happens to school libraries when students find it more natural to turn to a computer screen than a book? That is the question facing schools around the world as they struggle to keep up with the digital revolution while fostering a love of literature. Many have found creative answers, developing spaces that allow children to make discoveries, put technology to imaginative use, learn, perform, and relax – as well as to read. In the process, libraries have often come to be the school’s focal point. The library is not just a new physical space, replacing a traditional book-lined room that had buckets on the floor because of leaky ceilings; it also plays an important part generally in delivering the curriculum. It does this through e-learning and information literacy specialist staff who loan out equipment and support teachers and students in using it wherever it is needed. Only three pieces of equipment in the library are fixed, and these are for searching the catalogue. All other computers are laptops, with seating and tables equally moveable to allow the space to be used for exhibitions of pupils’ work or curriculum-linked displays, debates, presentations and even a jazz band. The library also has a contained space to give pupils a fully immersive sensory experience, with a big screen, smoke and wind machines and spotlights, used last term to enhance teaching on the first world war. Since the new library opened in September 2013 book loans have increased 400% and Shaw says the number of children borrowing has also risen dramatically. But the library continues to develop. “Education changes, students’ needs change,” says Shaw. The learning commons model, pioneered in the United States, which stresses flexibility in terms both of space and ways to think about learning, has set a clear blueprint for them to follow. The foundation has a junior school, senior school and a combined pre-school, infant and junior school on a different site, each with a new library, designed with the different age groups in mind. The junior library is made up of an indoor and outdoor space with a stage, special reading seat and cosy places to squirrel away with a book. All non-fiction books have been taken out and put into classrooms, leaving the library purely for the discovery and enjoyment of literature. The senior school library is based on the medieval idea of a cabinet of curiosities and is designed to be a place where older children can encounter information and knowledge in intriguing ways and make unexpected connections. It hosts temporary exhibitions, making full use of its location in Cambridge to source suitable artefacts for displays, which so far have included the Great War, Sherlock and a history of medicine. It also uses iBeacon technology to trigger information relevant to particular parts of the library directly onto students’ iPads as they move around. Teachers often hold lessons in the library, and Armitage says students appear to feel more comfortable in it than in its former incarnation. “It’s a space they can own and discover,” he says. Now the school wants to reinvent a library specifically for the sixth form, planning a space that encourages students to gather information not just from books and technology but also from listening to other people’s stories and points of view. The idea is to give them an insight into different life paths, as well as help prepare them for university. Inspired by the success of the nearby Eden Project, but with a budget of only around £15,000 and an empty 1960s concrete space at the heart of the school, teachers and governors decided to be creative. The vision was to “do something as exciting as the Eden Project, but for reading,” says Field. 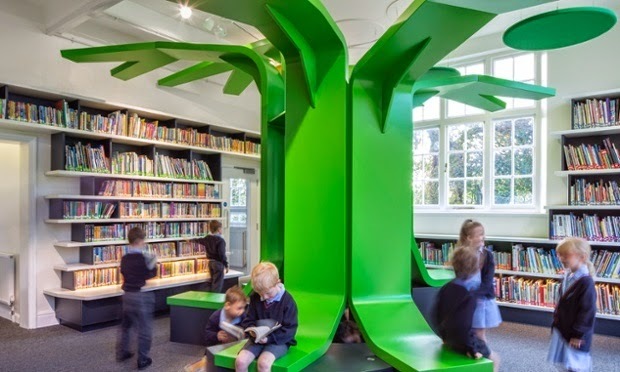 Driven by librarian Heather Foster, the space was transformed into a story garden, complete with astroturf floors, a hobbit house big enough to take an infant class, a reading tower tree house and toadstool tables to use for writing. There is a play area with a stage, and clothes to dress up in so children can re-enact a story they have just heard. A canopy covers the garden so everyone stays dry, but enough fresh air gets in for coats to be needed in winter. “We wanted them to feel they were in a different space,” says Field. Children can use it at playtime to read, while teachers sometimes take classes there. It plays a particularly important role on World Book Day when children enter the school through the story garden, which is transformed into a literary theme. Once it was Narnia, with polystyrene icicles. Another time it was the Roald Dahl’s Chocolate Factory and Field was Willy Wonka. Field is determined to keep developing the garden “otherwise it becomes run of the mill – we have to inspire children and move it on”.